Acne is a skin problem that many people suffer from. It can occur due to hormonal changes, unhealthy lifestyle and also due to stress. Acne occurs as blackheads, whiteheads and pimples. Some try a lot of remedies like lotions, creams and visit to beauty parlors. Washing your face three to four times a day and keeping it clean can prevent acne to some extent. The creams and lotions that you buy may contain chemicals which may be allergic to some skin types. So use them only after testing and making sure that you are not allergic to it. Nowadays laser treatment is also done to remove acnes. But this is expensive and not affordable for all. A number of home remedies are also available for curing acne. If you are keen to remove acne without harming your skin with any strong chemicals, then using tea tree oil is the best way. Acne is caused because of the excess secretion of the oil called sebum by the skin. The sebum, when in excess clogs the pores and also mixes with dirt and dust particles. This becomes a breeding ground of bacteria, which causes bumps on the skin. These small bumps formed by sebum and bacteria are called acne. The bacteria multiply fast and spread to the other areas also. If properly treated, you can get rid of this acne and have a clean and acne free face. Tea tree oil is an essential oil that is derived from the plant Melaleuca atternifolia, and is colorless or pale yellow in color. It is very effective in removing acne because it can penetrate through dust and grease and work as a solvent removing the acne. When you apply tea tree oil on pimples, it will penetrate through the dust and dirt and remove them from the pores, thus helping in unclogging the pores. The antibacterial property of the oil helps in killing the bacteria and preventing any further formation of acne. It is also antiseptic, which helps in healing the skin. One thing to remember when you use this essential oil is that it is only for external use. Never take it internally because it has toxins that cause you harm if taken internally. You must also take care to dilute it with water, as it is very strong and may cause allergy when not diluted. so you can see that tea tree oil can fight against bacteria, fungi and virus, is an antiseptic and also has the property to cut through dust and grease easily. For this you need half a cup of water and 3 to 4 drops of tea tree oil. Take the water and add 3 to 4 drops of tea tree oil to the water and mix well. Now take a cotton pad and apply the mixture on the areas where you have acne. You may also apply it all over your face if you wish so. Let it stay for 20 to 25 minutes and allow it to dry. When it has fully dried, apply the moisturizer that you use. You need not wash your face. Wash and clean your face and pat your skin gently before you apply tea tree oil on your face. After applying the diluted oil, if you feel a slight stinging sensation, you need not worry,. It is normal. How much you dilute the tea tree oil depends on the type of skin you have. If you have a sensitive skin, you may take 95% of water and 5% of the oil. For normal skin you have to take 90% water and 10% tea tree oil. You have to use it twice daily and soon you will see the difference it makes on your face. 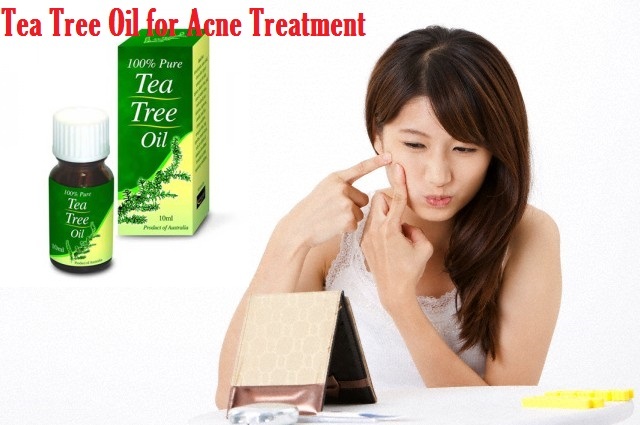 This is the most common method of using tea tree oil in the removal of acne. Here you need fresh aloe vera gel and 2 to 3 drops of tea tree oil. Aloe vera, as you know, is excellent for your skin. Take about one to one and a half teaspoon of aloe vera gel and mix the drops of tea tree oil on it. Mix both of them well and then apply on the places to be treated or on the whole face. Let the mixture dry on your face and allow the skin to soak it in. Once it is dry, wash your face with lukewarm water and apply a good moisturizer. Instead of keeping this mask for half an hour or one hour, you can also keep it overnight. This face mask is all the more beneficial for sensitive skin. For this method you need green clay oil, a few drops of tea tree oil and water. Add 2 to 4 drops of tea tree oil to one or two spoons on green clay powder. Now make a paste of it by adding enough water. Apply this paste on your face keeping more attention on places where there is acne. Wait till it dries and then wash your face with lukewarm water. Apply a moisturizer later on to prevent your skin from getting dry. It you are applying it only on spots, you may decrease the quantity of green clay powder and the oil. Since tea tree oil is strong oil, you may feel a tingly sensation when you apply it on the face. You need worry about it. Tea tree oil works very slowly and takes time. The result you get depends on your skin type also. So if you do not get the expected results during the first few weeks, do not lose hope. Continue using it regularly and you are sure to get the best results.